Regardless the reality or not of this event (we'll see when it occurs) the hype seems to be in line with the recent trend towards the "dangers that lurk out there into space". A preparation for the Elenin comet, or for something else to come, maybe? Or rather, possibly, pure media alteration of reality with the sole traditional purpose to add to our daily fears? Especially when there is absolutely nothing you can do to defend yourself, and you have to solely rely on them for your hopes. You know they love the feeling. - On Oct 26, 2010, the International Space Station performed a debris-avoidance maneuver in response to a conjunction with this satellite. - Of the 26 pieces expected to survive reentry and strike the surface, the largest piece is expected to have a mass of 158.3 kg (349 pounds), and to reach the surface at a velocity of 44 meters/second (98 miles/hour). Smaller pieces are expected to strike the surface at up to 107 meters/second (239 miles/hour). If you read the above-linked NASA page, it should be evident to anyone that the UARS 'mission statement' is intimately related to Global Warming issues and so forth. For now, I will stop here and let anyone research for him/herself the UARS in further detail. This post is only meant to stimulate everyone's capacity for critical thinking. "If you find something you think may be a piece of UARS, do not touch it. Contact a local law enforcement official for assistance." Caption (wikipedia): "UARS in Discovery's payload bay during mission STS-48"
IMAGE 1 : THE UARS - photograph credited to "Vanderbilt8"
Caption (wikipedia): "A bright pass of the UARS satellite, photographed by Marco Langbroek from the Netherlands on 16 June 2010." The same old video we are all familiar with. You be the judge. Are these videos real? 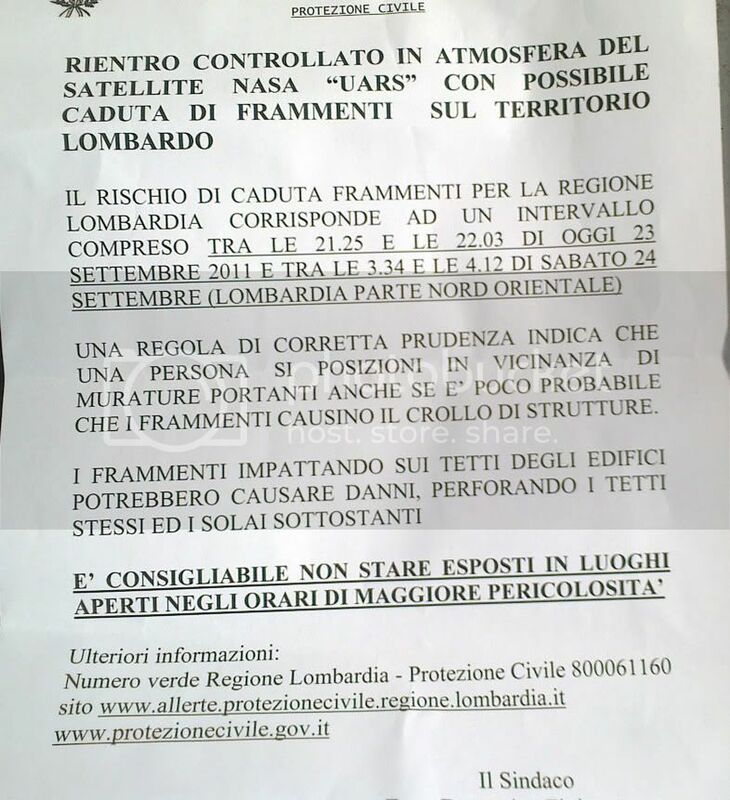 È paura nel Nord Italia per tutto quello che potrebbe arrivare dal cielo. I frammenti del vecchio satellite Uars della Nasa che domani si distruggerà a contatto con l'atmosfera potrebbero infatti cadere sulle regioni del Settentrione. Allo stato delle simulazioni è questa la previsione degli scienziati che ne stanno analizzando la traiettoria. La zona di caduta individuata è un'area di 200 chilometri che comprende Val d'Aosta, Piemonte, Lombardia, Trentino Alto Adige, Veneto, Friuli, Liguria ed Emilia Romagna. I AM RIGHT THERE UNDER THE RED LINE! I AM GOING TO DIE AREN'T I?! No you're not. You cannot die out of thin air. Anyway, tonite I was invited to visit the ESA (European Space Agency) premises in Frascati. You won't believe this, but the mother of my friend Fabio has cleaned their offices for the last 20 years. She took us around as if we were VIP's -and I even got to meet and hug an Italian astronaught - Umberto Guidoni! More about my visit to the ESA "open door-day" tomorrow! They might just as well have stopped mid-sentence at their first line as far as I'm concerned..."There is no credible evidence yet of UARS..."
I'm with Ivanfm. You mean to tell me that bastion of all things space, AND Norad have no idea where their "satellite" fell? But, they can spot an Earth-like planet 100 million light years away? I bet if it was a Russian or Chinese plane that was coming in for a landing they'd know and would not supposedly have a glowing tail of fire to mark it's passage, either. You will pardon me, I hope, that this non-event event in no way changed my view that satellites are probably just another NASA hoax and corporate money scam. Unleashed wrote: I'm with Ivanfm. You mean to tell me that bastion of all things space, AND Norad have no idea where their "satellite" fell? But, they can spot an Earth-like planet 100 million light years away? I'm convinced that they do have rockets and they do put satellites into orbit (talk to a ham radio operator). And I'm telling you, on a clear night you can see them go by. But you're right, most of the NASA press releases are nothing but "Disinfotainment". In my opinion, there's a big ongoing militarization of space, and NASA basically puts out phony press releases about sending bits of the World Trade Center to Mars and shows silly video clips of people drinking Tang while weightless. I think you're absolutely right about the story of them not being able to find a satellite the size of a bus is patently ridiculous. Presumably they put out these stories to make it easier for Congressmen to justify yet another budget increase. "If they have a giant bus falling out of the sky and they don't know where it will land, and it might land on our house, well then I guess they must need more money." "Controlled re-entry in the atmosphere of NASA satellite UARS with potential scattering of fragments on the territory of Lombardy." The leaflet goes on advising one to "position oneself next to main walls, although it is unlikely that the fragments should cause the structures to fall." "It is advisable not to stay in open spaces during the hours of greatest danger." So in the unlikely event that a metal fragment lands on your head while you're in the house not standing against a wall or out in an open field, should we suspect foul play? How convenient that we get this kind of news as they evacuated the space station. Since when has NASA announced that a satellite was going to crash? Why do they care to warn us about this now when they were never too concerned about the damage satellites may cause before, as they say in the articles? What’s really going on here? I think that this is all further conditioning for a psy op in space. They are clearly building up a threat from space in very subtle and not so subtle ways; there is no other purpose for these kinds of news pieces in my opinion. Dcopymope wrote: How convenient that we get this kind of news as they evacuated the space station. Since when has NASA announced that a satellite was going to crash? Why do they care to warn us about this now when they were never too concerned about the damage satellites may cause before, as they say in the articles? What’s really going on here? I think that this is all further conditioning for a psy op in space. They are clearly building up a threat from space in very subtle and not so subtle ways; there is no other purpose for these kinds of news pieces in my opinion. You stated my thoughts precisely. There will be another test the end of next month when a German X-Ray telescopic satellite is due to crash with even higher odds of being hit by stray pieces. Or so they tell us. Yeah, I can see the hoax coming a colossal mile away. Here is how this all works. They know exactly how they are going to stage their next false flag event, but before they do it, they gauge the public’s susceptibility to buy what will become a very specific part of the coming psy op as plausible. That’s the real purpose of all this, its predictive programming, you alter the enemies perception in advance under the guise of "entertainment" and "news". Once the data comes back and it’s reviewed by their psychological review boards, they tweak the psy op as necessary to make sure it succeeds, because the end goal of all psy ops like 9/11 for example is mass persuasion. If the review boards conclude that the masses won't buy it, then they abort the operation altogether, because the operation will fail. Dcopymope wrote: If the review boards conclude that the masses won't buy it, then they abort the operation altogether, because the operation will fail. Hopefully, this is something this forum can possibly contribute towards - in the long run. We have been gradually catching up to expose the silly psyops of our times - in spite of lagging far behind the perps in strategical terms. With our combined acquired knowledge, let's now do our best to stay ahead of the upcoming psyops. That's what has to be done, we have to stay ahead of them, but I'm not going to say anything to anybody until it happens for the sake of credibility. I'm going to wait for them to make their move on the chest board. Here is my theory on how this false flag event may play out, it is basically a merge of what I've already been saying. For the last few months, they have been telling us that the Comet Elenin is under "intelligent control". Look at the article below from the eutimes for example, it reads more like it came from an online conspiracy site than a mainstream news site, very suspicious indeed. I had a feeling they were going to do this the moment CluesForum member "sayiamu" started the thread about Elenin. Russian Defense Ministry says that Comet Elenin under "intelligent control""
A chilling report prepared for President Medvedev by Minister Serdyukov of the Russian Defense Ministry on the building of an additional 5,000 underground 'bomb' shelters in Moscow warns that even though progress is being made, the appearance of the new Comet Elenin [photo right] in our Solar System means "additional resources" will have to be added "immediately" as the 2012 timeline for completion "may not be soon enough". Sparking the fears of Minister Serdyukov, he says in this report, is that based upon the new orbit calculations for Comet Elenin, it appears in "all likelihood" that this celestial object is under some type of "intelligent control" and will approach our Earth "much closer" than originally thought this coming fall season. If we are to assume that this Comet is to be used for a psy op this year or at a later date, it seems that as this Comet gets closer they will tell us that it is actually a spaceship or being followed by one, regardless of whether or not the Comet itself is even real and it isn't totally made up in of itself. The populace have been recently conditioned for this with the movie "Battle: Los Angeles", because the hype we are seeing about Comet Elenin is basically the plot of that movie. The Space Station blows up, or crashes, and the media will tell us it was attacked by the spaceship they originally thought was a Comet, kicking off the fake alien threat with a bang like the 9/11 attack kicked off the fake terrorist Al-Qaeda threat, or the "War on Terror" with a bang. The perps have been conditioning our subconscious for the last fifty odd years for the fake extraterrestrial threat so that when they stage an alien event, we will respond to it exactly as we've been conditioned to respond just like we responded to 9/11 exactly as we were conditioned to respond (Watch "Reel Bad Arabs"). They made sure every single living generation got this conditioning. So if the perps really do go live with this false flag op, it will be interesting to see how the general populace of the world reacts to it, because this is what's going to really matter in the end.